The Paradise collection by Jennifer Taylor Home is the perfect addition to any living space looking to add a bit of a modern flair. The fabric selected for the collection features a polyester and viscose blend and engineered for long life. Our wood frames are made from kiln dried birch wood which provides exceptional support and stability. 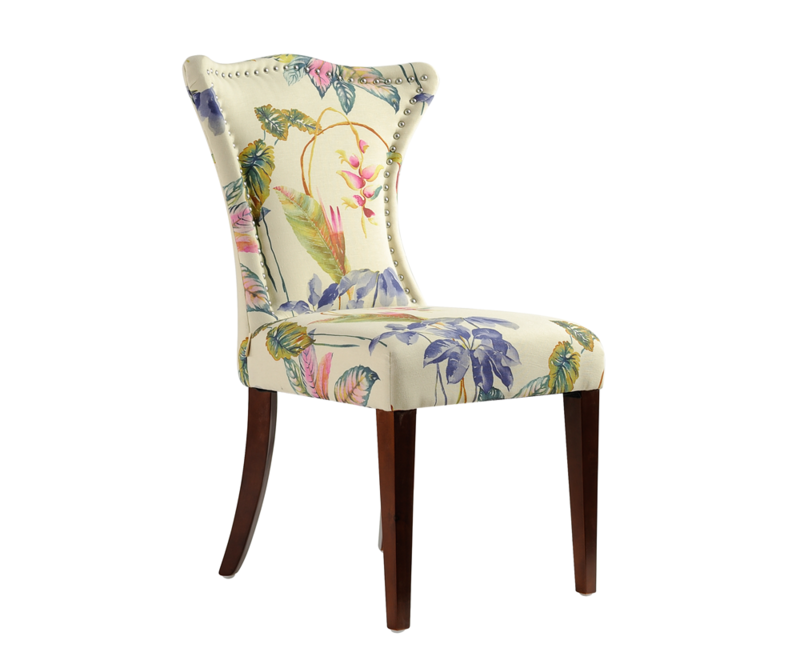 This accent chair is accented with a nail head trim along the edges of the back rest. The Paradise is an ideal choice for the dining room or living areas. This accent chair brings class and lounging comfort to any room in the home, whether it’s used as additional seating for guests or extra space to spruce up your home decor. We offer a unique versatility in design and make use of a variety of trend inspired color palettes and textures. Our products bring new life to the classic American home. 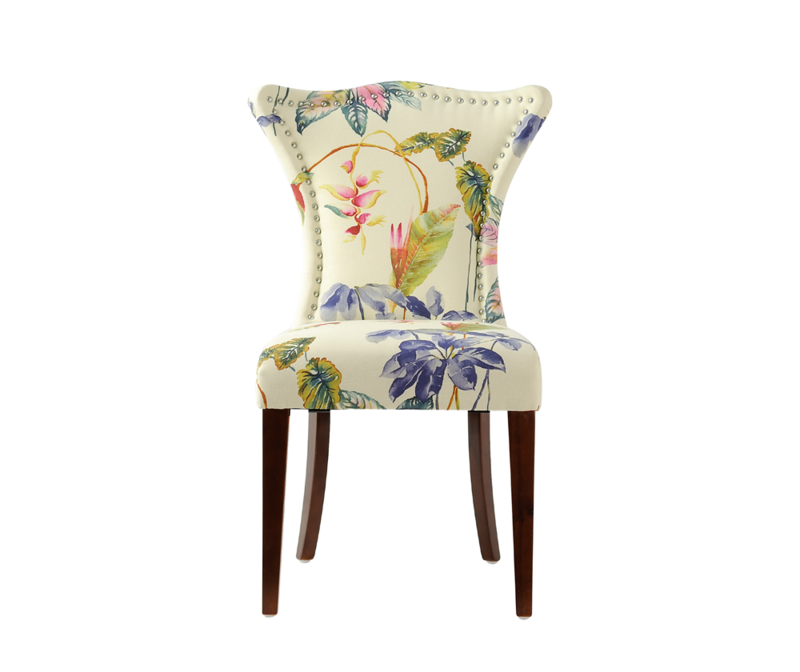 The Paradise Upholstered Chair is the perfect addition to any living space looking to add a bit of a modern flair. The fabric selected for the collection features a polyester and viscose blend and engineered for long life. Our wood frames are made from kiln dried birch wood which provides exceptional support and stability. This accent chair is accented with a nail head trim along the edges of the back rest. The Paradise is an ideal choice for the dining room or living areas. This accent chair brings class and lounging comfort to any room in the home, whether it’s used as additional seating for guests or extra space to spruce up your home decor. I bought these for my dining room. They are unique, thats wha i liked about them. But, the colors are so vivid and beautiful, i just love it. They are well made and sturdy. i think they can go with any decor, i put brown rattan chairs at the ends of the table, very elegant with a pop of color. I bought 2 of these and could not be happier with the quality of these chairs. They are just beautiful and perfect for what I needed. Upon receiving it, I was a little concerned because the box was labeled/written on as being returned by another customer. The chair is in perfect condition, and most importantly, is a comfortable, firm seat for regular use at my home desk area. The only assembly needed was to attach the legs (located inside the underneath of the seat, under the velcro ticking). Laughably, the legs can be attached correctly or backwards, so double-check the directions before screwing them on. The colors are just as bright and rich in-person as you'd expect from the online photos. Initially purchased for the Master bedroom; my husband loved it in the dining room, so we bought a second chair! Our beach house is basically well, beach...lots of blues and greens. I wanted a pop of color in our room but the chair is too beautiful to keep hidden. We love it and are eager to receive the 2nd chair. My beautiful chair arrived in great time and looked exactly like the photo. It was easy to put the legs on....the only thing that had to be done and it looks beautiful in the bedroom. Thank you very much!